Home » English posts » Porcupine Bezoar Is The King Of Herbs? Porcupine Bezoar Is The King Of Herbs? A few years ago when I was in childhood, the people in my village have often talked about the porcupine bezoar stone and they said, if you are lucky enough to acquire a porcupine bezoar, will earn a lot of money if sold in the traditional Chinese medicine market. 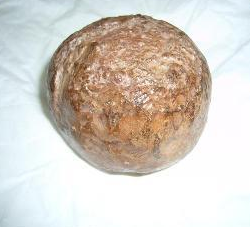 At the time, I did not know whether the use of porcupine bezoar and until I was an adult, I tried to assess whether the use of a porcupine bezoar in the medical field. According to traditional Chinese medicine beliefs, porcupine bezoar has been written in the book of ancient Chinese medicine, and most popularly used by hill tribes in southern China and Southeast Asia in the past. Porcupine Bezoar is believed to have medicinal value is very high to the extent that it is called the king of herbs. In Malaysia, the porcupine bezoar stone sold at very high prices once reaching thousands of ringgit. Most of the buyers are Chinese herbal medicine and classify the rich to serve as preparation for the disease and to treat life-threatening diseases. Even so, medical bezoar only recognized by the Chinese community in this country. Porcupine Bezoar very difficult to be obtained because the stone can only be obtained in the stomach porcupine and besides, not all the porcupine has a bezoar. According to Chinese traditional medical records, a porcupine will produce bezoar when the animal is facing the disease. These animals will be looking for some herbs to treat himself and will eventually form a bezoar stone in the stomach. In northern Borneo, Sabah, most people in this country, especially the Kadazan Dusun, Murat, know well the porcupine bezoar and they deeply know the Chinese herbal medicine (Sing Sang) in the state will buy these herbs with a very high price. In my village, most of the population has secured porcupine bezoar stone, through the results of the hunt in the woods. A few years ago, a friend of mine has acquired 7 porcupine bezoar stones during a trap in the woods and he sold all porcupine bezoar to traditional Chinese herbal medicine by price, RM30,000. While traditional Chinese shop to buy at a great price, I know, they've tens of thousands more profit by selling in Southeast Asia market. In my view, very difficult to verify the correctness of the effectiveness of this herb, as, has been kept secret by the Chinese for centuries and, traditional Chinese herbal medicine believe, porcupine bezoar is the king of herbs that can cure many diseases that are harmful.